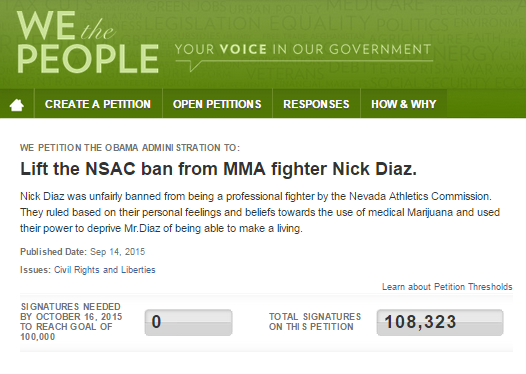 Nick Diaz White House Petition Crosses 100K Threshold – What Will This Mean? MMA fighter Nick Diaz resonates with the public. After being banned from combat sports for 5 years by the Nevada State Athletic Commission for a controversial positive marijuana reading following UFC 183, there was an outcry of support for Diaz and criticism of the NSAC. Perhaps the most interesting of which (in addition to securing the support of Cher and former rival Georges St Pierre) was a White House Petition started by fans. White House petitions promise review by staff if ‘enough support‘ is reached. In the case of Diaz ‘enough support’ meant at least 100,000 signatories by this week week, a threshold that was just eclipsed. So does this mean that Barack Obama will swoop in to Nevada, overturn the ban and clean house at the NSAC? Not quite, all that this means is that “White House staff will review it, ensure it’s sent to the appropriate policy experts, and issue an official response“. The official response will be that combative sports are regulated by State governments, this is not a matter of federal concern and that the White House defers to State Governments to ensure the fair regulation of combative sports. Although this will not result in a legal victory, reaching over 100,000 supporters willing to publicly voice support is a political victory of sorts. Just like the Teamsters letter to the Governor of Nevada, and fighters refusing to compete in Nevada in protest to the NSAC’s actions this petition’s ‘success’ is further pressure on the State to review the high handed actions of the NSAC. Ultimately this matter will need to play out through judicial review. As previously projected, Diaz likely will not be able to escape some punishment for failing to disclose recent marijuana use on his pre fight questionnaire. Being a third time offender will warrant a harsher penalty than those received for first infractions. The 5 year suspension, however, will likely be set aside as being arbitrary and capricious. Ongoing support may not in and of itself overturn Diaz’s current suspension but it may motivate the State to reach a compromise of sorts in the ongoing legal proceedings. Ideally the State should be prepared to admit that the suspension was out of line, Diaz can admit he was not candid on the pre fight questionnaire and a compromised term of suspension can be reached.